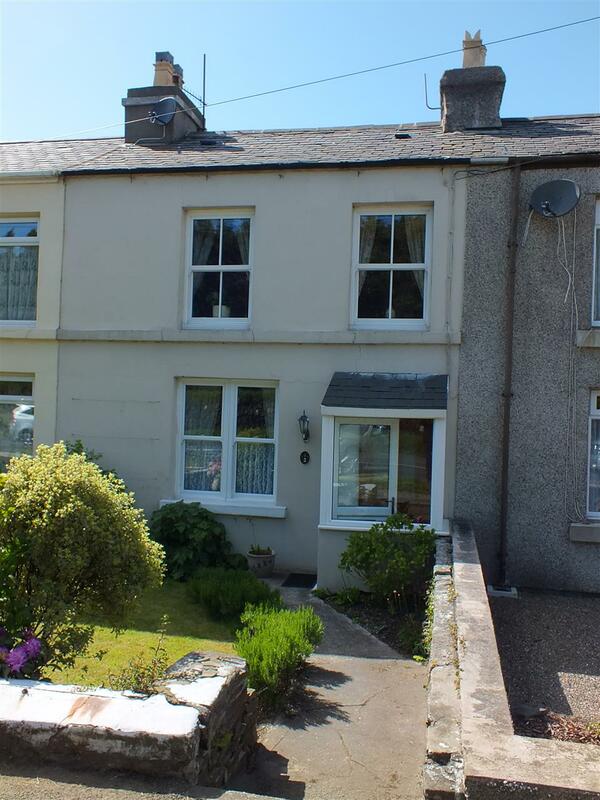 Delightful Mid Terrace Cottage in a Semi Rural Location on Main Bus Route. Enjoying a Pleasant Wooded Outlook to the Front & Countryside to the Rear. Surprisingly Spacious Accommodation, Offered in Excellent Order Throughout. Modernised & Generally Updated by Current Owners Since 2011. Comprising Porch, Lounge, Kitchen & Lower Ground Floor Dining Room / Study. 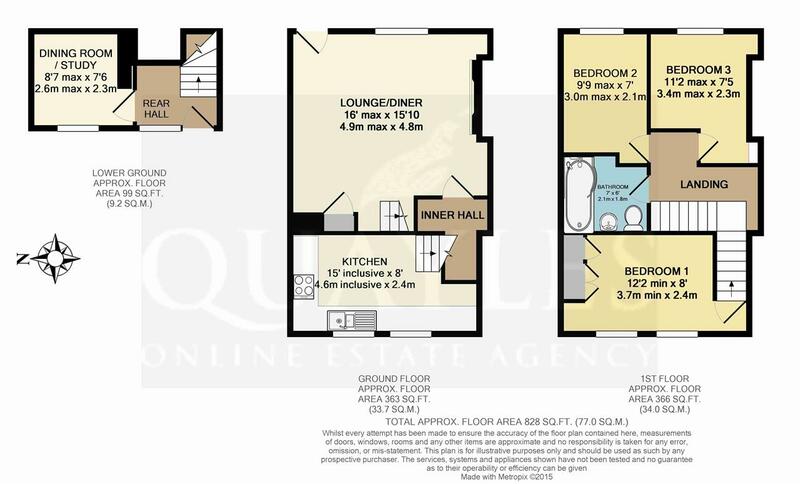 3 Bedrooms & Fully Tiled Contemporary Styled Bathroom with Shower Facility. Oil Fired Central Heating & uPVC Double Glazing. Fabulous Lawned Garden with Shed Located Just Across a Shared Access Lane. Roadside Parking with a Lay-by Providing Additional Spaces a Stones Throw Away. Leave Douglas centre via Peel Road and at the Quaterbridge roundabout exit left onto the New Castletown Road. Continue up Richmond Hill beyond the Mount Murray complex. St Anne's Terrace will be found further along on the right hand side, number 2 being the middle of three houses with lay-by parking close by. The property itself being identified by our For Sale board. Of uPVC double glazed construction on a low wall base with a covered polycarbonate roof and half glazed entrance door. Quarry tiled floor. Double glazed inner door with decorative inserts. A generously proportioned room with a large sliding sash double glazed window to the front enjoying a wooded outlook across the road. Stairs off to the first floor. Attractive fireplace with an oak surround together with a granite background and hearth together with an inset 'Dimplex' electric fire with realistic flame effect and convector heater. Recessed, illuminated shelves with built in cupboard beneath. Cupboard housing the electric consumer unit. Coved ceiling and centre light on a dimmer control. Further built in shelved cupboard. Television and satellite points. Telephone point. Door to the inner hall. Recess suitable for a shelving unit or similar. Understairs recess with power point. Wall light. Steps up to the kitchen and down to the rear hall / entrance area. A naturally bright room which enjoys fabulous rural views across the pretty garden via twin uPVC double glazed windows. Fitted with a good range of 'Limed Oak' fronted wall, base, drawer and larder units together with complementary oak effect work surfaces incorporating a 1 1/2 bowl stainless steel sink with a mixer tap. Additional glazed display unit. Back ground tiling. Space for a washer, dishwasher and dryer. Integrated fridge. Built in electric oven with an inset ceramic hob above and pull out filter hood. Coved ceiling and smoke detector. Easy care, vinyl floor covering. A naturally bright area with an obscure glazed uPVC door and side panel which gives access to the rear garden. Tiled floor with up stands. Deep recess with a double power point. Currently home to a fridge freezer but having potential to create a built in cupboard if required. Recessed downlights. Door to the dining room / study. Located on the lower ground floor and enjoying a lovely outlook across the rear garden via a uPVC double glazed window with a built in double shelf / window seat. Space for a dining table and chairs. High level shelf. Coved ceiling. Oak effect, laminate floor covering. Steps lead off to bedroom 1. Coved ceiling. Smoke detector. Access to a boarded attic via a pull down ladder. Fully tiled walls with complementary tiled floor. Fitted with a stylish white suite of 'P' shaped jacuzzi bath with a curved screen and 'Mira' electric shower over. Pedestal basin and push button flush WC. Wall mounted, mirror fronted cabinet and glass shelf. Extractor. Ceiling spot light fitting. Heated towel warmer. A small double / large single room located to the front and enjoying a wooded outlook over the road via a uPVC sliding sash window. Coved ceiling. Fitted corner shelving to recess. A large single room with a similar outlook to bedroom 2, again via a uPVC sliding sash window. Wardrobe recess and shelved alcove to either side of the chimney breast. Coved ceiling. A good size double room enjoying fabulous garden to rural views via twin uPVC double glazed windows. Built in triple wardrobe with central drawers and mirror. Space for additional furniture and a 5 foot bed if required. A shared access path leads behind all three properties. An external 'Firebird' oil fired boiler is situated on the outside wall of the property along with a cold water point. Paved patio area. Raised bed. Concealed oil storage tank. Shaped lawn with well kept, colourful borders. Fencing to sides and rear. Good size wooden shed with windows providing natural light and pleasant rural views. Two shallow steps lead down into the lawned front garden with colourful planted borders and a concrete path to the main entrance. Night light. Mains electricity, water and drainage. Oil fired central heating - boiler replaced approx 2011. Double glazed in uPVC.